I’m still on the edge of fainting after preparing chicken livers for dinner. It was my first experience with these velvety little organs, and quite frankly I’d prefer to go hungry. Flipping through the September Gourmet with mom over the weekend, we came across an appealing recipe for chicken livers with grapes and caramelized onions. 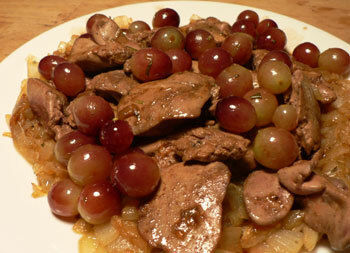 I like chicken, I like grapes, and I can eat caramelized onions for dessert—why not try cheap and abundant livers? I figured that no matter how unappealing the organ meat was, I’d have all these other good things on the plate to distract me. Think again! Emily B was nice enough to talk me through the washing and separating of the lobes, telling me how difficult it was for her to handle calf liver the first time she made pâté. It gets easier the second time, she insisted. Well, there isn’t going to be a second time. I’m just not convinced that I can eat anything that must be separated into lobes. But I took one bite of one liver and that was it. I hate to be a baby about this, but the texture of liver is the opposite of what I want to eat, and it makes me want to purge. Chianti was on the table, so I couldn’t even use drinking to make me forget what was in front of me without Hannibal Lecter whispering in my ear. Speaking of foods new to me, I ate rabbit for the first time today for lunch. Do any of our New York readers know a good local source for this delicious, approachable meat? I guess no one ate the livers, then, because I know how Nathan feels about organ meats. What a shame, because this sounds so good. When you were kids I used to make chicken livers with onions and bacon served over rice and I THINK you ate them, although it’s hard to remember. I browned the livers pretty well in the bacon fat, so they had a bit of texture. As for rabbit, you can get whole rabbit at Wholey’s Market here in Pittsburgh in the Strip. Maybe you can get Rebecca to bring you one next time she comes to visit? Though I’m sure any respectable butcher in NYC could point you to a place to get rabbit. I’m almost surprised Colin hasn’t beaten me to it, but he could give you a great recipe for rabbit sausage that he made a few months ago. It was really quite impressive. What, liver? Rabbit? I was just outside with my neighbors for a couple hours, and one of the things that came up was the enjoyment I get from making sausage. One of my neighbors, who is a surgeon, couldn’t bear the thought of cutting open a baby rabbit! Ah, well. Anyway, I don’t know about a recipe… because I don’t use recipes… but I can tell you rabbit meat is a bit dry, so it would be in your best interest to mix it with some fat. I recommend lamb, but I suppose pork would work well, too. Nathan was way less squeamish than me tonight; he ate at least three “lobes.” Of course he loves anything that’s this cheap! Mom: we are so cool with our gravatars and everyone is jealous. If you can’t find rabbit at a local butcher, you can order it from D’Artagnan..
I’ve always thought one thing that really separated the British from the Americans was their fondness for eating KIDNEYS for breakfast – at least they’re always eating them in the novels I read. Imagine facing those first thing in the morning, even if they were deviled. Kathryn, I’m just picturing trying to get through airport security with a dead rabbit in my carry-on! The cheapness and nutrient richness of livers appeals to me too. I mash them with a fork after cooking and eat them warm or cold the next day. Think about it, nice warm mashed liver, spread on a piece of toast, with nice cool grapes (or any other contrast of flavor and texture and temp) on top. Maybe some onion or mustard. Or apple. With a big big salad it makes for a full meal. Yum, zp! That sounds really good to me; maybe take Luisa’s liver roasted in the chicken fat along with some onion roasted in the same drippings, mash or chop, season with plenty of salt and pepper, I love the mustard idea, and I would garnish with some capers or just put them in. Serve with toast or Rye Krisp. Yes that helps. 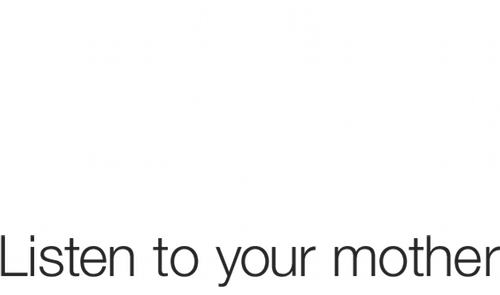 The problem is they’re so unfamiliar in the mouth, you start to doubt that what you’re eating is “food.” Your mind starts to fill in the blanks, and nothing good ever comes of that. But if you break them up enough, it’s like a sauce. A heavy, think, chalky, insane sauce. It’s a reference point anyway. I would take down the vinegar a notch. You can’t even relax eating the grapes and onions. With every bite this recipe is screaming for attention. Gravatars, hm? Let’s see if this works. Love your gravatar, but if you say “lobe” one more time I’m going to be sick! That’s good advice from Luisa! I think that’s the only way I’m going to get through a chicken liver. And that still might send me to the fainting couch. As would mashing up a liver and spreading it on toast. Although I do enjoy pâté made with liver, especially with plenty of mustard and cornichons. I used to get rabbit at the grand central market. It’s very reasonably priced and they have both pre-marinated and plain available every day! I really like chicken and beef liver; however, lately, I’ve noticed that when I eat them, 2 things happen. (1) I get a migraine headache, and (2) my stomach hurts. Strange. I’ve eaten both types of liver all my life, but now I can’t. Anyone know where in Pittsburgh except Wholey’s that has rabbit for sale. There use to be a small market in Blawnox called Hugo’s that sold whole rabbits. These kinds of small places have all but dried up here in Pittsburgh. Unless it’s a small Italian market then forget it. Sad. Places like Giant Eagle carry the same ole thing day after day. zzzzzzzzz! after you cook the liver and onions in lots of butter, let them cool, throw them in a bowl. Add hard boiled egg and miracle whip and mash and mix with a potato masher. Meanwile, roast a red pepper until black on all sides, put in a bowl and skin it. Bake some baguette until crunchy and cut slices. Layer on good pesto, chopped liver and top with the roasted pepper. Delish. My mom copied this from Amsterdams on Amsterdam in Manhatten back in the early nineties. I came from a family of 4 siblings, 3 or which were 1.7 years apart and then lil sis 7 years my junior (the former baby). The original kids were forced to eat chicken livers, my mom’s reason to live. Lil sis was never forced to eat anything she didn’t like and got special meals while we literaly gagged. Oh, we had the dog under the table, of course, which helped. The point here is the 3 of us who were forced to eat these things love them today. Lil sis, who wasn’t, hates them, likes them this way. I LOVE chicken liver! I cook them in a non-stick pan with butter, sprinkle on onion powder and garlic salt, and fresh ground pepper with a sprinkle of dried basil. TO DIE FOR. Just like that, plain and simple. Satisfies sooo many cravings! I have read that the if you are watching your cholesterol you should avoid them, but I have also read all about the many vitamins and iron they contain. Don’t think too much about what it is that you are eating, once you get the taste for them, you won’t care anymore!